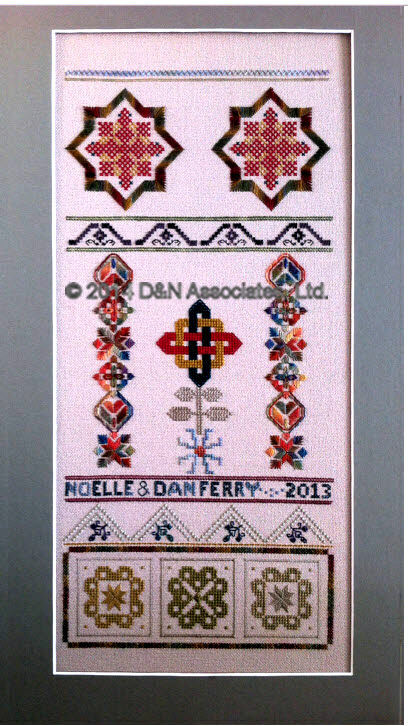 The main design for this sampler came from Barbara Rakosnik’s Queen Knot Sampler design booklet that I purchased from her website. The top two star-like worked designs are from a Permin handanger design I worked previously. 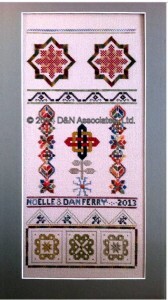 The two long side bands in the middle are from a Nordic Needle bookmark design. My main goal was to use bright fall colors from my stash. Luckily I had a bit of Gloriana, Weeks Dye Works, Gentle Arts and Kreinik silk threads and variegated cotton threads on hand from previous stitching projects. Worked on 28 count (tan color) fabric, finished size is about 16 x 7 inches.